Spend any time downtown and you will see one of the big green buses rolling around. Those are for the Music City Circuit, the city’s free circulators. Mostly, they’re there to help tourists get around, but a good number of folks use them to connect with the Music City Star train, get to and from work, or cross downtown on their lunch breaks. The buses are also environmentally friendly! Nashville and Chattanooga both have these electric buses to move folks around their downtown areas. Here is a PDF map of the routes. This route runs from Bicentennial Mall to the Riverfront Station (corner of 1st Ave and Broadway) for the Music City Star. Like the Green Route, you can hop off and on at the Arcade and near Broadway. This route also begins at Bicentennial Mall and runs by The Arcade, but instead turns towards the Gulch (11th Ave South near Demonbreun) once it goes past Bridgestone Arena. It is the longer of the two routes. There was the Purple route a few years ago that ran to the Howard School complex (home of a good portion of Metro government), but it was discontinued. Use a real-time transit app (Transit or Music City Transit Tracker). You’ll hear us say this a lot 🙂 With downtown traffic being bumper-to-bumper at times, you will want to see if there is really a bus on its way. Budget extra time. While the regular bus routes run on a set time schedule, the free buses are much harder to predict because of the current construction situation. 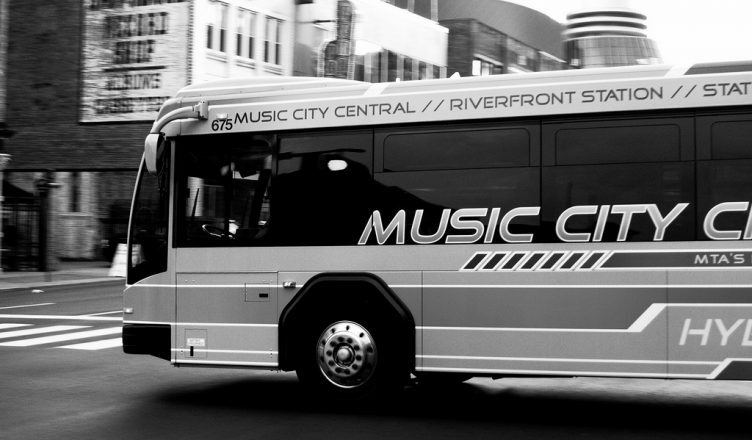 Look for the bus signs specific to the Music City Circuit. The buses will not usually stop at the normal blue MTA signs, even if they are along the same route. Beware the unexpected detour. The driver will usually warn you if the bus needs to go the charging station instead of back to Bicentennial Mall or if they need to skip lower Broadway because of an event. Be prepared to walk a bit. The routes bisect most of downtown, but they definitely do not go everywhere. Also, if traffic is really bad, you may end up skipping the bus altogether.